Yes, eating a pure vegetarian diet means eliminating dairy; but that doesn't have to mean giving up creamy, delicious sauces. This weekend I made a hearty, creamy pasta dish with a marriage of lemon caper sauce and a traditional cream sauce that tasted so fab, I couldn't wait to share the recipe. You can build this sauce in just a few minutes and have the entire meal on your table in less than 30. 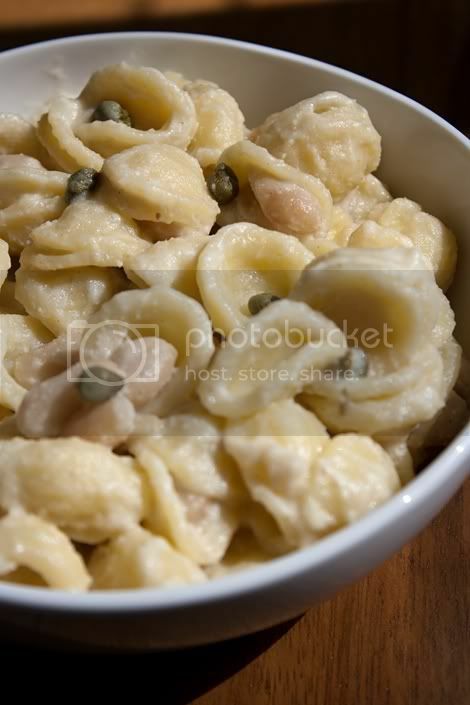 I chose orecchiette because I just love the bite and how these little ear-shaped pasta hold sauce so perfectly, but fettuccine would be another wonderful choice. Before I post the recipe; for those who have been wondering about March's meetup of the Recipe Trail Club, the verdict on my carrot cake, and where to get the recipe: The verdict was two thumbs up — super moist and delicious. Unfortunately, I'm not able to give out the recipe on KLB — this cake is being tested as a part of my Sweeties brand (you can read about it here). But I'll keep you posted on any new developments in getting Sweeties back out to the public. To start: Bring a large pot of water to a rolling boil over high heat. Salt the water with two tablespoons of kosher salt or sea salt and add the pasta. Cook until al dente, stirring occasionally, about 11 minutes. Drain and return to the pot you cooked it in. While the pasta is cooking, prepare the cream sauce: Melt Earth Balance in a small saucepan over low heat. Add flour and stir until completely combined. 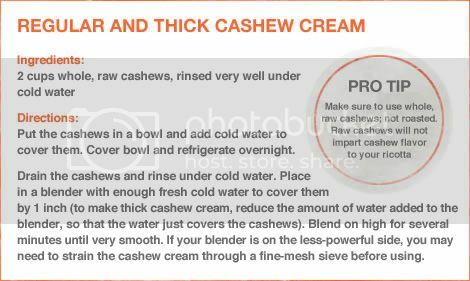 Add cashew cream and Silk creamer, and continue stirring for 1 minute. Add lemon juice, capers and liquid, and white pepper. Continue to stir and cook until sauce thickens, about 3 to 5 minutes. Prepare the pasta: Pour the sauce over the cooked pasta you've already returned to the cooking pot. Stir and toss to coat. Add the cannellini beans, salt and freshly ground black pepper to taste, and stir and toss to mix in. Serve immediately.